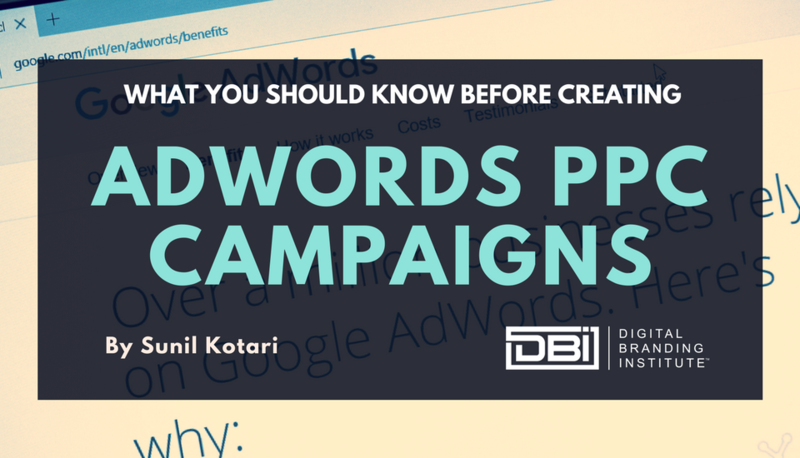 Adwords PPC campaigns are a huge part of digital branding. Marketers must know all the rules behind PPC campaigns in order to be successful and make the most out of it. From knowing what goals to define to pointing out the flaws that get in the way of success, here’s everything you need to know! The digital marketers often put immense efforts to create a PPC campaign which is so captivating that people are more than happy to click it. The reality, however, is something else. Though the Pay Per Click campaigns are 21 years old, the marketers are yet to master the paid campaigns on the search engines. The platform is ever-changing so much so that what was relevant 6 months ago could become an outdated practice today. Most of the marketers dive into creating paid campaigns with unclear goals and vague understanding of the metrics. Regardless of the experience, one cannot ignore the fundamentals on which the campaign was built. The campaigners who overlook this fact end up making fewer conversions. A new campaign manager is likely to make a few beginner mistakes, but this blog is an attempt to list out a few aspects that any professional marketer should consider before and while executing the Pay Per Click campaign. What is the point of starting a journey when you do not know where to go? A marketer should know what they are expecting from the PPC campaign. Scrutinize the data to determine the campaign goals. The campaign goals help the marketers understand how to steer the PPC campaigns while achieving the desired result. In order to get there, the marketer should analyze the brand’s position in the market. Determining the market position will help the campaigners assess opportunities, threats, and strengths. The market analysis also reveals the weaknesses which could affect the results of the campaign. By evaluating the brand’s market status, the campaigners can have data-driven, measurable, and realistic targets. A non-pre-defined campaign goal is a waste of money. It is important to understand the difference between the above three campaigns because otherwise, the differences between them could be a costly mistake. The difference is the user’s intent. Search Engine Marketing is trying to reach the qualified user on the internet through paid search listings. • Active online searchers of the business related products or services. • Users who appreciate a smooth and easy experience. • People who will likely react to the sales pitch. The Display Ad focuses on targeting the audiences who are not familiar with the brand but are conducting business related searches. The consumers for the display ads are likely to have the below-mentioned behavior. • “The intent to shop” pointer swings from medium to low. They could be future high-intent buyers and are likely to not react to the ad copies. • They are unlikely to understand the product or service the business is providing. • Consumers will appreciate more information about the business. • They may react to subtle persuasion. The Paid social advertising targets the qualified audiences who are looking for the business related products or services and the existing followers on the social media platforms. • The audiences are unlikely to make a purchase immediately. • Not interested in the detailed information about the business. • Will appreciate and subscribe to the seamless and consistent experience from the ad to the landing page. It is important to categorize the qualified online consumers; target them with the relevant advertisement which addresses their requirements. It is very important to customize the landing page and the ad copy for the target audience. It is of paramount importance for the campaign managers to aim and bid for the high performing keywords. In addition, the data analysis will help in understanding the keywords. The marketers should conduct thorough research and understand the search patterns. Tools like Uber Suggest, SEM Rush, and Keyword Planner (for Google search campaigns) will give the marketers an idea of how people were searching for their business related products or services. After the Hummingbird update, the long-tail keywords have become relevant to the SEO and SEM strategy. The target keywords should have the right mix of long tail keywords and specific search phrases that target the above-categorized consumers. The marketers can avoid attracting the unwanted traffic by identifying and using the negative keywords. It is always too late to test the website’s conversion funnel if you are doing it after the campaign is active. Most of the Digital campaigners forget to check the conversion funnel before starting the campaign. The high-intent customer who clicks the campaign expects seamless smooth experience, where he can register with his contact details or easily conduct the sale transaction and check-out. Dysfunctional or poor quality landing page will be a costly mistake. The marketer should test the landing page before starting the campaign. Often, marketers get carried away with the market research and data analysis that they end up creating an Ad copy which is best described as average. The campaign managers should remember that the competitors are also trying to target the online users with same online search and buying intent. It is important to understand what the competitors are doing; not to mimic them, but to do something different. This is where the campaign managers should bring in their creative expertise to create the compelling ads that inspire the targeted audiences to click on the ad and respond to the call for action. Running the paid campaign for the first time is an overwhelming experience for the Digital Marketers. There are several metrics to focus on and often one or the other if forgotten. The great advantage of digital marketing is it allows optimizing the campaign to perform better when the campaign is active. A few aspects to consider when the campaign is active are listed below. A quality search marketing campaigner can assess the performance of keywords as soon as the campaign is active. The long-tail keywords may take some time to show results, but the monitoring specific keyword performance is important. Often the campaign managers get carried away with adding new keywords to test without discarding the non-performing keywords. The non-performing keywords attract unqualified prospects to the landing page. The bounce rate is likely to go high because the destination where they land is not specifically what they are looking for. Cost per click will grow higher with lower conversion rates. The following process helps to evaluate the keyword performance. • The Click through rate should be high which should also compliment the quality score which should not be low. If these two factors are low, then the cost per click is higher. Meaning, the marketer is spending more money on the non-performing keyword. • The Cost per acquisition should be pre-determined while establishing the goals. The keywords with low click through rates (usually less than 1%) and with the higher cost per acquisition should be removed. It is alright to get rid of the non-performing keywords. Optimize the campaign with the keywords that are registering more conversions. The search engines help the marketers track every aspect of the campaign. The insights give a detailed picture to help improve the efficiency of the campaigns. However, the account managers often lose focus and end up following the wrong metrics. The campaigners should use the Google value track parameters to understand the data and optimize the campaign to generate better results. The value track parameters measure the landing page efficiency and gather the information about the sources from where the ad is getting the clicks. Marketers can check the campaign relevancy with the help of the same value track parameters. The value track parameters are extremely useful for the account managers to understand and track the campaign’s performance. Not every investor is same. Sometimes, the account managers have to manage to run the campaign and generate the desired results within the limited budget. In such scenarios, the marketers have to get a little creative. Marketers can schedule the ads by activating the campaigns only during the peak times. The bids can be lowered or completely turned off at certain times. Campaign managers should closely observe the time when the traffic is responding positively to the campaign. Ad scheduling is one effective way to manage the daily budget of the campaign. Cost per lead is one of the important metrics, but focusing only on the lead generation is a huge mistake. The purpose of the search ad campaigns has shifted from merely generating clicks to motivating the qualified traffic to register with the business. The cost per lead is an indicator but does not measure the success of the campaign. Many campaigners may have faced the situation where the cost per lead is more, yet the profits registered are low. The focus of the campaigners should be on the profits. Thorough data analysis will give you an insight on the basic bottom line. Observe the keywords which attract low costs per sale and the search terms that are generating more conversions. The focus of the marketer is to generate the return on the investment. When the campaign objective is to generate sales leads, the follow-up schedule is quite important. The campaign managers should understand that the phone calls are the important source to generate sales. The Google’s call forwarding feature helps us track the calls and schedule the appointments with the clients. Call tracking is not a difficult process to follow. The forwarding numbers used in the ad copy call extensions and record the calls to the ad group. Marketers can place a tiny code in a site that replaces the contact number with the forwarding number. This allows the marketers to track how many calls the campaigns have generated from the website. The above-mentioned aspects are overlooked by both the experienced and new PPC campaign managers. It is important to register these aspects during several stages of the PPC ad campaigns to deliver better results and generate a better return on investments. Keep these tips in mind when creating your next Adwords PPC campaign! Sunil is a content marketer and branding strategist at BenErg Software solutions. He wrote several blogs and articles on Digital Marketing. He's a comic book geek, fiction lover, and TV series binge watcher when he is at leisure.